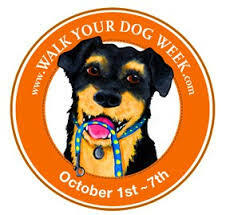 This week is National Walk Your Dog Week. It's a great time to enjoy the fall weather and get in shape with your dog. Now that the hot weather is almost behind us, your pooch is ready to go. Walking your dog has so many advantages for you and your dog. It's a GREAT way to meet your neighbors, make new friends and build up strength. Even if your dog is old or has arthritis, a walk down the street can do wonders for your dog.